The Brecon Beacons offer a spectacular landscape rich in natural beauty. Free from light and noise pollution it’s the perfect respite from the chaos of modern life. 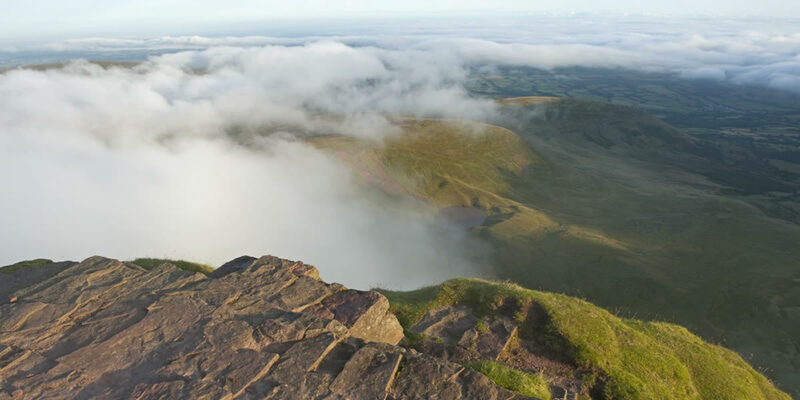 Whether you’re seeking challenging walks, wide open spaces or secluded waterfalls, the Brecon Beacons provides the best of them all. Pen-y-Fan, the highest point in Southern Britain, stands proudly flanked by Corn Du and Cribyn. From Fan y Big looking west towards the Beacons you can get the most stunning views in the whole area. You can also be sure to miss the crowds on this less-visited peak. Nearby Cwm Sere, Cwm Oergwm and Cwm Cynwyn are beautiful and serenely quiet glaciated valleys nestled at the feet of the central Beacons. The terrain is much less challenging but the views are equally impressive. For a gentler amble, head to the upper Tarell valley, which runs from Libanus to the Storey Arms. There are plenty of meandering walks through ancient woodland, where you can enjoy views of Craig Cerrig Gleisiad, Fan Frynach and the central Beacons.